Provides an additional 9 horsepower and reduces weight up to 14 pounds depending on model. Select model or see full description below to see weight savings. 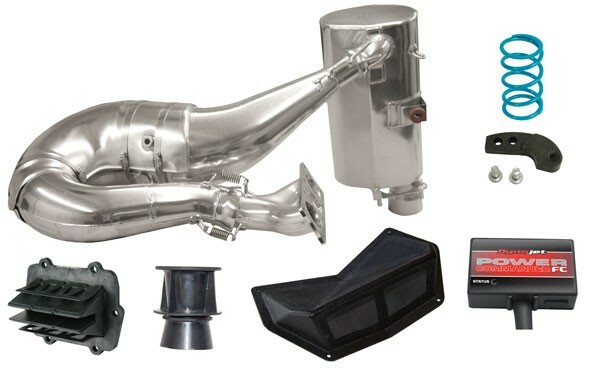 Run with the big dogs with this Stage 3 Kit for your 600. We added a set of V-Force 3R reeds and an air horn to the air box baffle plate to take our extremely popular Stage 2 kit to the next level of performance. These two modifications used in combination with our SLP Single Pipe Set, High Flow™ Intake Kit, PCFC fuel controller with SLP pre-programmed map and SLP Power Shift™ Clutch Kit delivers an additional 9 horsepower with 4.5 lbs of weight savings on 2013-16 models (3.7 lbs on 2012 models). This combination creates a lightning fast sled with wicked throttle response. This sled is very quick out of the hole and has long legs on top. Your friends will have a hard time believing that it is still a 600. *ERA 2014 Silencing Technology utilized on Indy, RMK, Pro-RMK and Switchback Assault Models. NOTE: We recommend adding our Powder Valve™ for maximum performance in deep powder snow conditions.